This article will show you how to add, edit and delete rooms. To add or edit rooms, you must have Organization Administration permissions. Select the Location the room will be associated with. 4. Set the Room Short Name (4 characters max). The room short name will default to the first 4 characters of the room's full name. This field can be edited as needed. The room short name will be displayed in appointments in your calendar. Under Current Locations, click on the name of the Room you wish to edit or click the Details button next to the room name. 3. Make any changes to the name or short name. You will not be able to edit the location once a room has been saved. If you wish to change the location the room is associated with you will need to delete the room from the location. 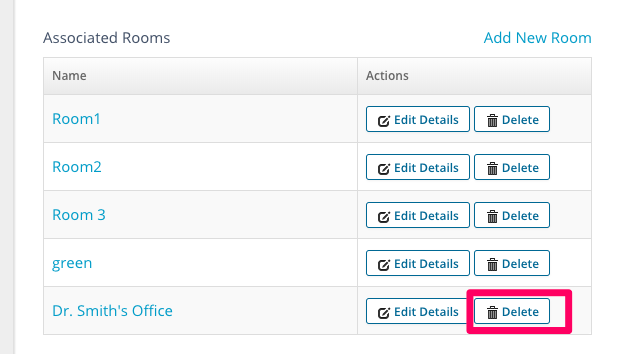 Under Current Locations, click on the Details button under the action column next to the location the room is associated with. 3. Scroll down till you see the Associated Rooms list. Click the Delete button. 4. You will be asked to confirm you want to delete that room. The room association will be removed from ALL past and and future appointments. These appointments will still be associated with the parent location. If you're sure you wish to delete the room click the Delete room button.